Where were we in our saga? Ah, yes, fronts done up to the end of the short row instructions. The next bit was casting on for the back of the neck, which the instructions have you do separately for each side. What I did was cast on both sides worth of stitches altogether, joining both sides into one piece. I still really have to wonder why the pattern does not have you do it that way. The flap is a nice straightforward knit till it’s the right length bit of this pattern. There was a moment of panic as I reached the correct length and showed my progress off to The Husband. I was trying to show him how the collar would sit and somehow managed to convince myself that I had twisted the collar when I cast on the back of the neck and joined the two pieces. Thankfully, he convinced me to put it down and look at it again in the light of morning. The next morning I realized I had been trying to label a shoulder as the collar and that got me all turned around. I put the live stitches at the bottom of the back collar flap onto waste yarn for the garter stitch striped edging. 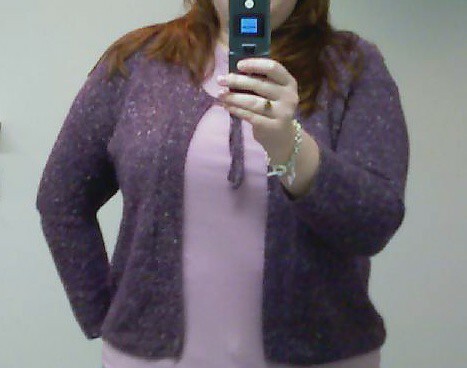 The back was the last part of the main body of the sweater for me to knit, and I finished it without incident. Of course, once I cast it off at the back of the neck, it dawned on me that perhaps I should have done the back before completing the collar pieces as I could have simply picked up the back flap stitches rather than casting them on. Now I will need to seam across the entire shoulder/neck area. 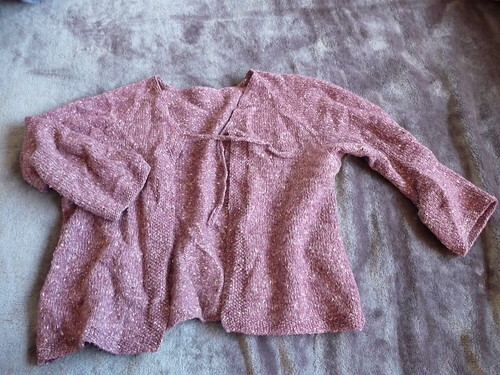 It will either help lend structure to the sweater or it will look funny; only one way to find out. I had knit a good portion of the bottom of the sweater (about 6 inches) when Tour de Fleece started. So, the sweater was put aside while I worked on my spinning and then my Ravellenic Games knitting. Labor Day weekend I pulled it out again. I figured out how much the garter stitch striped edging would measure, and subtracted that from what the total length was supposed to be before beginning the armhole shaping. Because I had cast on the sweater as one whole piece, I started with the right side for the next part of the pattern. As you start the armhole shaping, you also start the collar shaping, which is a folded over portion of a sort of shawl collar that becomes the back flap (Is there a better name for that, does anyone know?). Because the collar is folded over and shows stockinette stitch on the front, it gets purled on the right side of the piece. Does the pattern mention this? Not really. Now I knew, because I could easily see that from the pattern photos, but did that stop me from somehow screwing up the increases in such a way that it looked like garter stitch? No. The collar progressed nicely once I got to the part that just has you continue without anymore increases or decreases till it’s a certain length. Then, the shoulder shaping was pretty straightforward. The next step is some short row shaping on the collar, which was written out alright except for the part where it doesn’t tell you to pick up and knit the wraps when you go back over all the stitches. This would explain why there are a few of these sweaters on Ravelry that looked like there was something odd going on with the collar at this point; wraps were probably left unknit. At this point I put the stitches on waste yarn and went to the left front, which went smoother after figuring out the eccentricities of the right side instructions. Oh, Little Sailor Girl, are you trying to send me off the deep end? Some background… This is a pattern that my sister saw a sample knit of in her local LYS/fabric/craft store. My brother-in-law being in the Navy, she thought this would be a fantastic sweater for my niece. 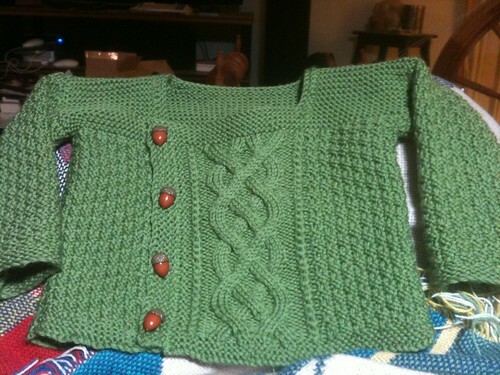 So, she and my mom called me up and persuaded me to knit an awesomely cute sweater for my awesomely cute niece. Once I was onboard, my mom bought the pattern booklet and brought it home with her to hand off to me to knit for my niece’s birthday, which is in October. I did a cursory glance over the pattern and determined that knitting a sweater for a child-who-will-outgrow-it-probably-quicker-than-I-can-blink out of the merino/cashmere/silk yarn used in the pattern was ridiculous to the point that I think I may have actually laughed out loud. 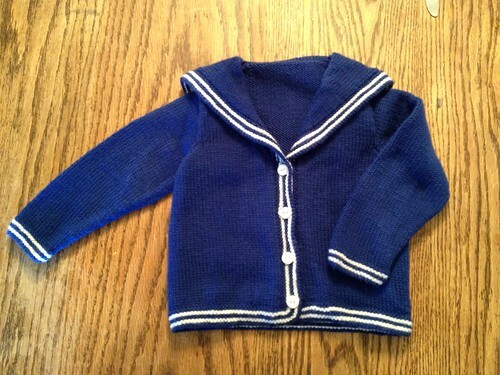 What two-year-old needs a merino/cashmere/silk sweater? Really? So, a trip in March to Purlescence Yarns had me swapping out the called for yarn with Cascade 220 Superwash in a bright blue with a pure white for the stripe. In June, I sat down to get started on the sweater to give myself plenty of time to get the sweater done. I took a look at other knitters’ versions on Ravelry and began to get the sense that something was wrong with the pattern. The major problem seemed to be that the cute little sailor flap on the back of the sweater is knit in two parts and seamed up the middle; this is not something you can tell from the pattern pictures as none of them are shot from the back. I think the average person seeing the pattern photos would assume that the flap is one piece; I know I did. The idea of a seam running down the middle of it just didn’t appeal. No worries, several people had made modifications to eliminate the seam and it sounded easy enough to do. I read the pattern through and found myself reading parts over and over again because they were confusing, and while the words were in English, they almost seemed to not be strung together in a recognizable order. I got things sorted out by realizing that the pattern called for you to cast on the striped edging for the bottom of the fronts, up along the button bands, along the collar, and around the back flap for each side; you then cast off all but the bottom of the front portion. The back is not as complicated, just calling for the striped section at the bottom of the back. I cannot for the life of me figure out why they would have you knit the entire length of the stripe, then have you stitch it on. Picking up and knitting the stitches seems so much easier of an idea. So, the sweater was cast one, back and fronts all in one piece, with a provisional cast-on for picking up the edging stitches later. I think I really need to cast on a new sweater. The few store bought sweaters I wear are not really good for fall or winter (i.e., cotton and acrylic blends rather than wool). And the few hand-knit sweaters I have for myself have all fallen into disrepair. My poor Ribby Cardi has pilled something fierce and both shoulder seams have split. One of the cuffs on my Mr. Greenjeans caught on something and is unraveling, so no wearing it till it’s fixed. And… that’s it for sweaters. So, there are 2 sweaters up as possibilities — Tempest in Rowan Felted Tweed (purple) or a plain crewneck pullover in Rowan Felted Tweed Aran (red). I’m leaning towards the pullover first as it would probably be the easiest to get on the needles and finished. Tempest would require more careful swatching in order to match gauge, and I’d have to fiddle with the pattern because I’d be knitting it without the stripes (some of the directions are based on stripe repeats). Now, I just need to finish my Celaeno test knit, my self-designed socks, and OMG! a baby blanket cause my niece could come as soon as a couple weeks from now. One piece of advice. No matter how nice a sewn cast-off looks, I don’t recommend it if you ever plan on ripping it out. That took for…… ever….. But, once I got the cast-offs out I made quick work of the sweater with my ball winder. Only occasionally hit a few snags due to the alpaca in the yarn. The stockinette parts were much easier to rip out than the seed stitch borders. There were a few places were the yarn caught and broke, so I do have a couple smaller balls. 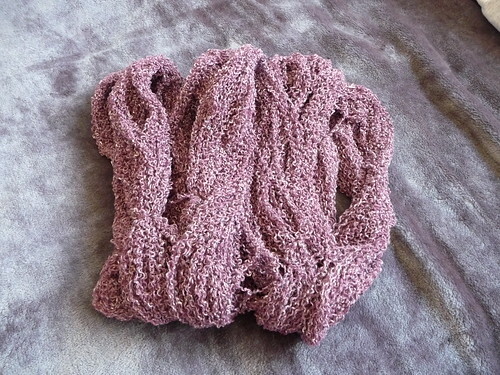 What was really nice is once I got the yarn reskeined and into the bath, it came out beautifully. 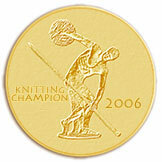 You would never know that it had been previously knitted. Now, I just need to knit up a swatch to determine needles and size to be knit. New sweater here I come!